I was wondering when the juice is mixed in for the second fermentation what kind of juice should be used? I hear that the fermentation only takes place when there is sugar to feed off of. The lemon juice I was going to use is 100% lemon juice, no sugar added. Will this work? It’s hard to know for sure but Kombucha can have alcohol in it! Some people don’t know that, so that may have been the problem for you. Please help as I’m starting out with this. I bought the culture and organic coconut water. Mixed them and left the at room temp for about 18 hours, glass jar, used wooden spoon and covered with cheese cloth and coffee filter. After that I put it into the fridge for one week now. I haven’t strained anything, it’s the same mix with plastic lid in the fridge. Today i took it out to taste it and it’s just weird, not slimy or gooey but just an unusual taste. What is coconut kefir supposed to taste like ? The mixture at this point has sediment at the bottom. Can u explain or email me please at apt604 @ gmail .com ? I really need assistance I mean trying t I make it for my son and need to make sure I’m doing this right. So I’ve been wanting to try making this but have a few questions before I get started. So I’m going to buy water kefir grains online. Once I get them and do the first fermentation process, can I keep reusing them? Say I finish the first batch, can I strain and then refill with more coconut water and continue doing that every 48 hours? I’m still a little confused with how the whole reusing or refermneting goes. Also, I have TONS of bottled Zico coconut water and I was wondering if I could use that? It has 9 grams of sugar so it will definitely offer plenty of sugar to the kefir grains. Lastly, when I brew can I use a cloth and rubber band on top? And will it make my kitchen smell funky? Thank you so much and can’t wait to hear back! Hi Donna, your website was sent to me by my sister who is living in michigan. So thankful she gave me this website. I am based in the Philippines. I would like to ask if you can blend pure apple juice with coconut water kefir and what other pure juices can be blended to the coconut kefir. When you say juice… do you mean the fresh juice of an orange/lime/lemon or do you mean the sweetened stuff? Also would adding dried non-candied fruit (ie ginger) be ok? Hmmm. Which culture are you using? What temperature do you consider “room temperature”? We keep a fairly cool house in the winter. 58 degrees at night. Thanks! Would it be ok to add the coconut water to the 2nd ferment? I am brand new to making water kefir and am worried that I may kill my grains. I just finished activating my water kefir grains. Thank you. I immediately tried a refreshing drink and substituted water to coconut water and enjoyed it. My daughter does not like the plain coconut water, but he liked the chocolate flavored coconut water as it is, so make it more fun I make a smoothie, which he enjoyed drinking. Can I use my milk Kefir grains or coconut water kefir? My house is really cold!! Should I try using my euro yogurt maker?? What if my house is really cold ?? Should I use my euro yogurt maker?? I made my coconut water kefir with probiotic capsule, I must hAve used too much (3 capsules) because it smells like vomit/ vinegar and frothy! I fermented it for 3 days! It is also extremely warm in my kitchen counter. Is it spoiled? Please help! What if you don’t have cheesecloth to cover the jar? Anything else I can cover the jar with? A coffee filter can be used if you don’t have a cheesecloth. I have just, today for the first time, put my water kefir grains into coconut water. Do you use coconut water all the time or do you give your grains a rest ever so often in sugared water to bump them up? 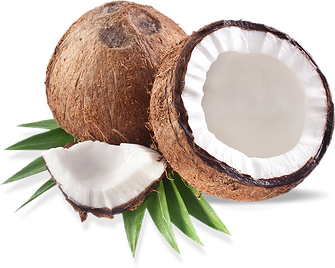 I am totally unexperienced with coconut water, I always used coconut water in the second fermentation, but my grains don’t behave as usual and I think it might be because of over acidity. When I was using Kefir grains I would switch between the coconut water and water kefir. Now I use the body ecology starter, which can be used with just coconut water. I am assuming by the picture that you are using “live” water kefir grains. Could you please confirm though whether you are using dehydrated water kefir grains or “live” water kefir grains for the first step. Thank you! 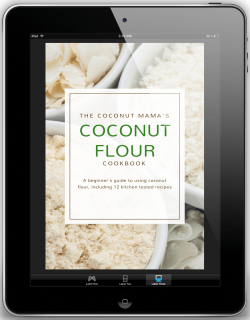 Hi Johanna, I’ve used both live kefir grains and powdered kefir starter to make coconut kefir. Both have turned out well. In this particular batch I was using live grains. Where do you purchase the bottles for making coconut water kefir? What are the bottles called? Thanks. Are the grains used for milk kefir and coconut water kefir the same type? I thought first ferment needed sugar to feed grains. I know some coconut water brands do put sugar in their coconut water but is it enough? And what if you’re using a brand with no added sugar? The grains survive on just coconut water and no sugar? Is coconut water the same as coconut milk? I was wondering the same thing. Second ferment on the counter and in the fridge later or in the fridge for second ferment and store in the fridge??? What are coconut grains? Where can I buy them in the Philippines, where I live. Do you have a receipt for milk Kefir? I just read your question. It’s a bit late but do you still need the recipe for milk kefir? It’s really simple. I add 2 litres of 3.5% fat, shop boughtmilk to 120 g of milk kefir grains. I leave it on the kitchen bench for 24 hours (in summer not so long) then I put it in the fridge until I need it. Then I strain the fermented kefir and repeat the process. I should be getting my grains soon. I love Kefir. Thanks for the recipe…. I do have a question. When you do the second fermentation, do you tightly cap the bottles and leave on the counter for 48 hours or so to get the fizz.